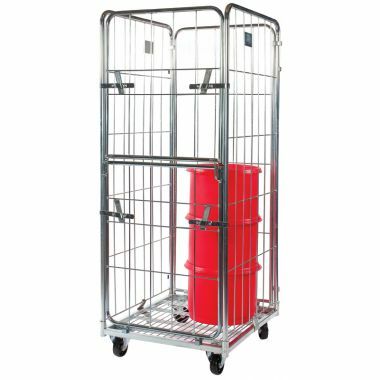 G-Force Europe offer a comprehensive range of roll containers and roll cages perfect for storage and distribution applications. Widely used throughout almost every industry the roll cage has become a staple solution for the containment and transport of goods, parts, components and produce. Our roll pallets are commonly used within the warehouse, distribution and retail sectors; however they also make a great mobile storage solution for many different environments and are available in both nestable and demountable formats. Nestable roll containers are an exceedingly good solution for transporting large quantities of goods on a regular basis. When the roll containers are not in use they are able to save on a large amount of premium storage space by folding down and nesting on one another. This attribute is ideal for large shipping applications and can save huge amounts of space on return journeys allowing further collections to be made possible if required. Our nestable roll pallets are available in 3 and 4 sided formats as well as large and jumbo sizes. 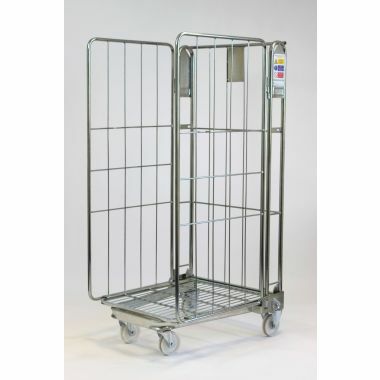 Our 4 sided nestable roll cages are also available in full security and drop-down door models. As well as nestable roll containers our range of demountable roll cages are also well designed to save on huge amounts of space. Easy to assemble, the sides of the demountable roll cages simply locate into the base of the container and when not required they can be fully dismantled. The demountable roll pallets can be supplied with 3 or 4 sides and optional shelves are also available. 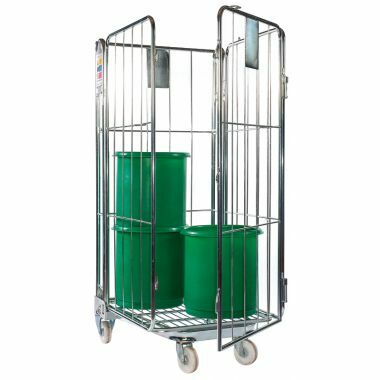 All of our roll containers are manufactured from a strong and durable steel that is then zinc coated for added protection; highly manoeuvrable castors are then added to the base to make them mobile and these castors can also be supplied in alternative formats if required including braked or rubber wheeled. 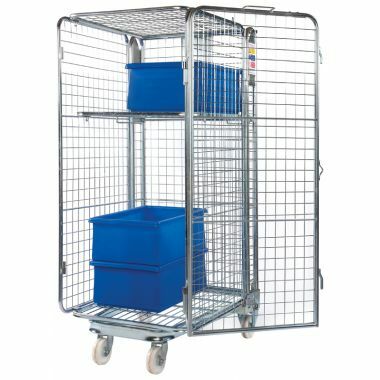 To compliment the range of roll pallets we also supply a variety of cage trolleys to assist with storage and distribution. 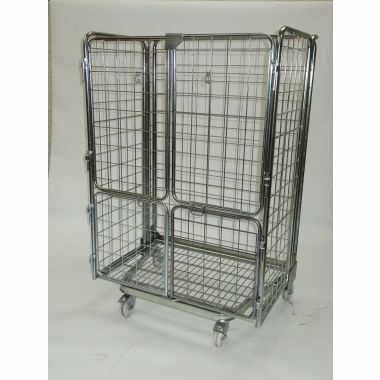 Often used within the hospitality industry these cage trolleys are available with wooden or steel shelves and can be supplied in a variety of different colours. 1. Demountable and nestable roll cages are ideal for storage and distribution. The roll containers offer a space saving solution for handling large quantities of goods, produce, parts or components within stock handling and storage applications through to shipping, distribution and transportation. Both formats of roll pallet are designed to save on storage space when not in use and can be used effectively within distribution, saving on large amounts of space on return journeys. This space saving attribute can enable return journeys to be utilised efficiently and further collections to be made if required. 2. Full security roll pallets are an ideal solution for storing and transporting higher value items. 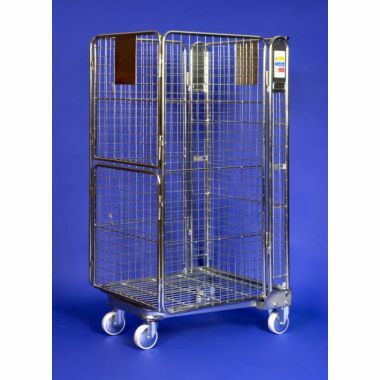 These types of roll cages are often used within airports and other high security environments for transporting or distributing valuable equipment or goods. Drop-down or stable door models offer a fast and efficient means for loading and unloading the roll containers without risk of contents falling out of the container; these styles of doors can often be found on the jumbo sized roll cages and are often used within warehousing and retail industries for stock handling and distribution. 3. All of our roll cages and cage trolleys are designed to be easily handled and highly manoeuvrable. Perfectly easy to manually handle the roll containers can be effortlessly moved about warehouses and distribution centres by hand. Typically supplied as standard with 2 swivel and 2 fixed castors the castor configuration and wheel types can be altered if required to suit your requirements. Optional additional shelving and nameplates are also available for the roll pallets on request.